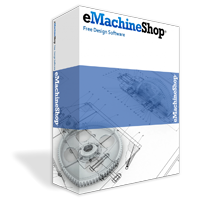 Preferences are optional settings you can customize for a more personalized experience using eMachineShop. Select one of the tabs at the top of the dialog. When starting, read last edited design. You can automatically reopen the last edited design each time you start the application for quick access. Check When starting, automatically read the last design edited. You can have your data saved to disk automatically to protect your data in the event of a power failure or system problem. You can also specify the frequency of autosaving. For example, you may want to have your design saved every 10 minutes. Check Automatically save designs and set a frequency of auto-saving in the every  minute (s) field. You can choose to work in inches or millimeters. Choose Edit | Preferences | Metrics. Check Show units of measurement when showing numbers to display “mm” or ” ” ” next to each number. Specify the desired number of digits. You can choose to specify angles in degrees or radians by selecting the corresponding radio button. The grid is a matrix of evenly spaced points to which you can align elements of your drawing. You can specify the size and spacing of the grid. For example, you might want to specify 4 grid points per inch when placing several holes 1/4″ apart. NOTE: Generally it is recommended to use the nudge feature instead of the grid since nudging has a similar effect and nudging does not lock you into a grid. Make the desired selections in the Grids are specified by group box. The distance between grid points can be specified in two ways: by the space between grid points or by the number of grid points per inch or millimeter. To display the grid check Show grid in the workspace. To hide the grid uncheck Show grid in the workspace (hiding the grid will NOT turn off the Snap to Grid feature). Use large grid spacing when working with large or imprecise parts. Use small spacing when working with small or precise parts. To specify the size of the grid enter the desired settings is the Grid Size group box. You can set how the rotation feature works by specifying to use a single point of rotation for all lines in your drawing or by specifying to use a separate point of rotation for each line. For example, when designing a round part such as a flywheel, a single point of rotation will likely be more convenient, whereas a complex device with several moving parts may be more conveniently designed by having separate points of rotation. To specify your preferred setting, check or uncheck the associated checkbox. To specify how circle sizes are be represented by checking radius or diameter. Generally, diameter is recommended. Workspace color is the background color that appears behind your drawing. You can choose the color of the workspace background. For example, you might prefer a light blue background. Select Edit | Preferences | Colors. Click the Workspace Change button. In the Color dialog box choose the desired color and click OK. In the Preferences dialog click OK. Selection color is the color of lines after you click on them. You can choose the selection color. Click the Selection Change button. You can select the color used for different line types in your drawing. For example, you could set Injection Molding lines to red. Select from the Fabrication Machines list. The Price File stores the latest pricing and other information, the file being updated frequently and normally downloaded for your automatically. You can also download the file manually if needed. Choose Edit | Preferences | Pricing . Check Direct or Indirect. First try the Direct method. If that does not work select the Indirect method. The Direct method might not work if your PC is connected thru certain types of firewall. HTTP Proxy Server is a service used on some systems that may be needed to place orders or download the price file. You can specify the proxy server settings. Choose Edit | Preferences | Pricing | Advanced. Specify the server address and port. This information is available from your network administrator or internet service provider (ISP). Or you may be able to find this information by examining the internet settings of other internet applications such as your browser. If you have a Microsoft browser installed, you can import the HTTP settings using the Import Settings button. You can place orders directly to eMachineShop in one command if your system supports direct sending of emails. Check Direct. If the Direct method does not work, select the Indirect method. You can add convenience features to the available commands. For example, you can enable toolbar buttons corresponding to the commands on the File menu. Choose Edit | Preferences | Customize. Check the appropriate boxes in Show these convenience features. You can create videos of how you created your design for training others. Click Capture Setup. This will: set the screen size to a recommended shape and size; center and resize dialogs; and select several other recommended settings. Start an animated screen capture program. Run thru the steps needed to create your design. Stop the screen capture program and save the resulting file.